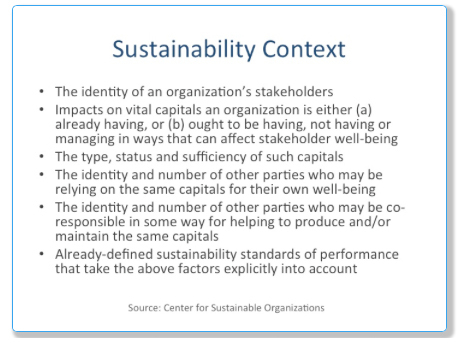 Context-Based Sustainability (CBS) is a compelling new approach to CSR and management in general that takes social, economic and environmental limits in the world (upper and lower ones) explicitly into account when attempting to assess the performance of organizations. In order for an organization’s use of, or impacts on, natural resources, for example, to be sustainable, it must neither put the sufficiency of such resources nor the well-being of those who depend on them at risk. And since many of the resources involved are shared, CBS also makes it possible to assign fair, just and proportionate shares (or allocations) of the responsibilities to maintain them to specific organizations. Originally developed by Mark McElroy at the Center for Sustainable Organizations as a way of narrowly addressing the non-financial performance of organizations, CBS is now being applied to economic and financial performance as well (by Thomas & McElroy), thereby resulting in the MultiCapital Scorecard™ (MCS). In the case of non-financial performance, the MCS is designed to assess impacts on natural, human, social/relationship and constructed capitals*. In the case of financial performance, it does so relative to impacts on economic capitals. Only the capitals change when attempting to assess the financial versus non-financial performance of organizations. Performance assessments in all cases, then, are capital-based and the same general principles apply. Of particular importance to both CBS and the MCS is the concept of carrying capacity and the idea that the carrying capacities of vital capitals must be maintained at desired levels in order to ensure stakeholder/human well-being – anything less is unsustainable. It is the effects an organization’s activities have on the carrying capacities of vital capitals (and the well-being of those who depend on them) that determines whether or not its operations are sustainable. The MCS, then, is an integrated (Triple Bottom Line) application of CBS that makes it possible to quantify and assess the sustainability of an organization’s performance in these terms. Indeed, it is the world’s first and only such context- and capital-based system that can help organizations answer the all-important questions: How much is enough to be sustainable, and are we?